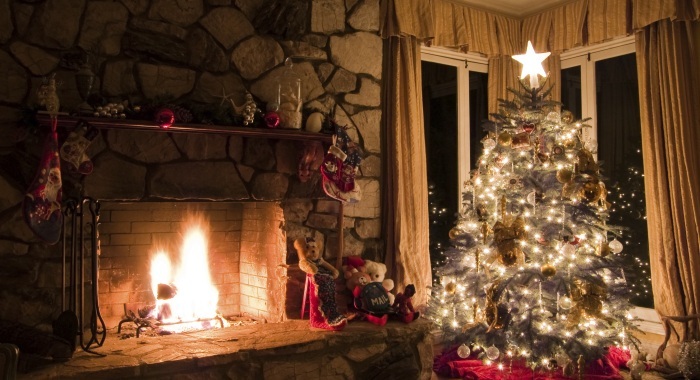 According to the U.S. Fire Administration, one in three home Christmas tree fires are caused by electrical problems. While you can save energy and have a safer Christmas by skipping all the lights this year, it just wouldn’t be the holidays without a few twinkling lights. Fortunately, you can still have the festive decorations and stay safe by following these 10 tips. Buy a fire-resistant tree. If you’re shopping for an artificial tree this year, make sure you purchase one labeled “fire retardant.” This doesn’t mean the tree won’t catch fire, but it will resist burning and can be extinguished quickly if it does catch fire. Find the freshest tree. If you’reusing a real tree, make sure you find one that’s fresh. It should be green with needles that are hard to pull from the branch and bend instead of break. Once you’ve got your tree home, cut the bottom at a 45 degree angle and stick it in water to keep it fresh. Allowing your tree to dry out makes it more likely to catch fire from electrical sparks. Place outdoor lights outdoors. This one may seem like a no brainer, but if you plan to hang lights outside, they need to be designed specifically for the outdoors. Retailers sell lights designed to handle inclement weather outdoors, while indoor lights could be damaged by snow or rain and pose an electrical hazard if used outside. Use insulated hooks. Hanging lights with nails, tacks or screws can pierce the cable on a string of lights. Instead, hang your lights with insulated hooks to avoid any electrical emergencies. Check your lights. Before you string lights up on your tree or in your yard, make sure they are functioning properly. Plug them in to see if all the lights turn on. If not, unplug the strand and replace the broken bulbs. And make sure you look for frayed wires or cracked cords. If you find that your lights have some damage, toss them out. You don’t want your lights to short and cause a fire. Examine labels. Christmas lights should be tested and verified by third-party laboratory Underwriters Laboratories. UL ensures products meet safety requirements for risks such as electrical problems and fire. Before you buy a box of new bulbs, make sure they meet this standard and have a UL label. A set of indoor lights will have a green holographic UL sticker on the cord, while indoor/outdoor lights will have a red sticker. Keep an eye on extension cords. Make sure your extension cords don’t overheat. Every once in a while just touch the cord to measure its temperature. If it’s hot, unplug it. Also, ensure that any connector pieces are off of the ground with a brick or rock. If the connector piece is left on the ground, snow, rain or dirt can find its way into the plug, creating a hazard. Don’t overload. If you put up a lot of lights each year, it’s important to distribute your light strands among multiple extensions cords. Each extension cord comes with a wattage rating. If the combined wattage of your lights exceeds that of your cord, it can overheat. The U.S. Fire Administration recommends linking no more than three strands of lights. However, if you’re using energy saving LEDs, the U.S. Department of Energy says it’s safe to connect 25 strands end to end. Turn off the lights. You shouldn’t leave your Christmas lights on all the time. Not only does it add up on you electricity bill, it’s also a safety issue. This holiday season make sure you unplug the lights whenever you’re not home or sleeping. Pack it away. When the holidays are over, pack up your Christmas lights in well-sealed containers. This will prevent potential water damage and also hinder rodents from chewing on the cords.